NVD Celebrations, NVD Competitions, Organize National Voters Day Celebrations on 25th January 2019 and Competitions in Educational institutions - National Voters Day on 25th January, 2019 -Organizing the National Voters Day and competitions in Educational institutions: Reference: Chief Electoral Officer, Telangana, Hyderabad U.O.Note No. 491. The reference cited, wherein the Chief Electoral Officer, Telangana, Hyderabad has requested to organize National Voters' Day celebrations on 25th January, 2019 to register the newly eligible youth (18+) in the electoral roll and also to promote electoral participation and requested that Schools and other educational institutions in the District are instructed to organize National Voters Day for infusion of democratic values among the students who are the future electors of the country and they also organize activities like debates, declamations, mock polls, drawing and quiz competitions on or during run-up to National Voters Day with the theme of democracy and electoral participation and also requested to take the NVD Pledge on 25.01.2019 to promote democratic electoral participation. "All the UP & High school & Junior college principals informed that the occasion of 9th National voter's day to be held on 25-01-2019. The following activities shall be taken up Junior & Senior level Elocution & Essay writing competitions. "How to become a responsible voter"
"Indian Democracy role of youth"
Therefore while enclosing the reference cited, I request you to take necessary action for celebrating the National Voters' Day on the above activities at Higher Education level/ School Education level in the District. 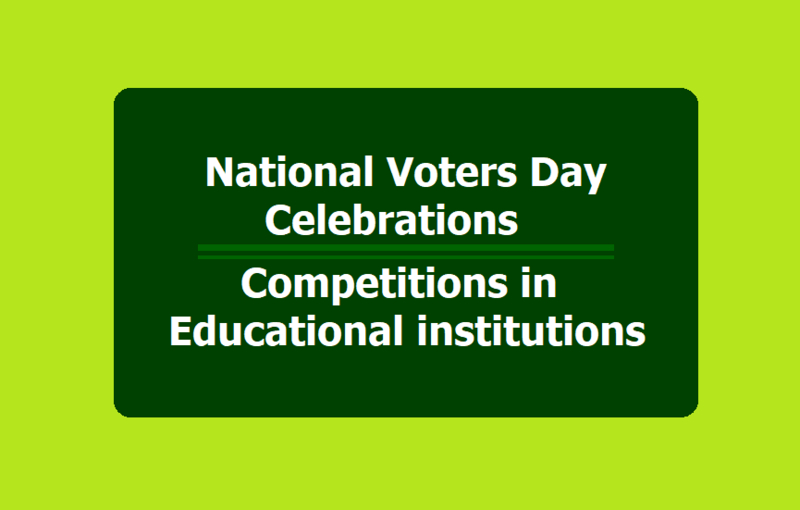 School Education - National Voters' Day on 25th January, 2019 - Organizing the National Voters Day and competitions in Educational Institutions - Regarding. The attention of all the Regional Joint Directors of Schools Education and District Educational Officers in the State is invited to the reference read above (copy enclosed) and they are requested to organize National Voters' Day on 25th January, 2019 for infusion of democratic values among the students who are the future electors of the country and they may organize activities like debates, declamations, mock polls, drawing and quiz competitions on or during run-up to National Voters' Day with the theme of democracy and electoral participation under the guidance of District Election Officers/Electoral Registration Officers in the district/ Assembly Constituency concerned. Therefore they are also directed to direct all officers and the Staff members under their control to take the National Voters Day Pledge (copy enclosed) on eve of the National Voters Day (25-01-2019) preferably around 11.00 AM to promoted Democratic Electoral participation. The 7th National Voters' Day shall be celebrated across the country at State, District and Booth level. The national NVD function at New Delhi is being graced by the Honourable President of India. While the theme for the 6th National Voters' day was 'Inclusive and Qualitative Electoral Participation, 7th NVD theme is "Empowering Young and Future Voters". 8th NVD theme is "Accessible Elections". 9th NVD theme is "No Voter Left Behind". The NVD celebrations in the State, as in the past, shall have the following components m addition to any other component that the CEO and the DEO may like to incorporate. The Booth Level Officers (BLOs) in each polling station area shall felicitate the newly registered voters on 25th January every year in a brief ceremony/ public function to be arranged by DEO/ ERO. As prescribed by the Commission, a badge with its logo with the slogan "Proud to be a Voter - Ready to Vote" shall also be provided by the BLOs to the new electors during the felicitation ceremony along with their EPIC. The DEOs would arrange for the venue and logistics required for the brief ceremony/ public function, in each polling station area. of those Part(s) under their jurisdiction where largest number of newly registered electors would be felicitated. Panchayat organizations, academic institutions, civil society groups, organizations of youth volunteers like NSS, NCC, Scouts & Guides, NYKS, media etc .. In this event, EPIC shall be distributed among new voters of the local polling station areas. with Media, Civil Society, Opinion Groups, Youth Volunteer Groups, State Administration, State Election Commission and Corporates etc. In this event also, EPIC shall be distributed among new voters of the local polling station area. effectively undertake NVD related activities. 1. Special Camps may be held with prior -publicity to allow electors to surrender duplicate registrations by filling form 7. 3. Citizens may be encouraged to fill part 4 while filling Form 6, to give details of their past registrations through proper dissemination of information in this regard. 1. "Young Voter's. Festival" through competitions in all Higher Secondary schools and Higher Educational Institutions, i.e. Colleges and Universities to be organized by DEO/ERO to serve as a build-up to NVD. Attractive prizes may be given to the winner of the competitions at District and State levels. 2. Online engagement with netizens in the form of activities, online games and competitions. iii. The District and State level winning entries to be showcased on CEOs websites. 1. For maximization of women registration, women-specific SVEEP campaign may be developed by CEOs. marriage and deletion of name from previous roll. 3. Women centric activities may be taken up to mobilize women for registration. 4. Sensitization of the BLOs towards women may be taken up during training. 5. AWW, ASHA and women self help groups are to be engaged for capacity building. 6. Women icons may be engaged for motivating the women through promotional messages. 1. Specific campaigns for creating awareness among urban migrants, persons with disabilities, tribal communities, homeless persons, transgenders, marginalised sections, and other identified groups. 11. Special registration drives for maximum enrolment of these groups. lit. Collaboration with NGOs, CSOs, Government Departments, PSUs and Corporates for reaching out to and actively engaging these groups. on 15th January just ahead of NVD. In addition, the Service personnel may be engaged with during the NVD celebrations as well. 1. Engagement of various forms of media-print, audio-visual, outdoor advertisement, troupes etc. for environment building. 11. FM and Community Radio may be widely utilized. iii. SMSes, e-mails, messages on social media etc. for propagating the theme. v. The NVD theme and related messages in form of posters and banners should be prominently displayed in the offices of the CEO, DEO, ERO and the VFCs (wherever functional). vi. A Print Advertisement shall be brought out on 251h January highlighting the theme. i. NVD may be celebrated m all Schools and Colleges and administered the NVD pledge through issue of necessary circulars. 11. Doordarshan (DD), All India Radio (AIR), Directorate of Field Publicity to be engaged for wide publicity and coverage of NVD. tu, Railways to be made partner for National Voters' Day publicity. iv. Civil Society, Corporate Houses and PSUs to be made partner. v, Appeals/ messages by local icons. Voters' Day on voluntary and free-of-cost basis. 2019. Commission shat I review the preparation of the NVD celebrations. The Departments of Higher Education / School Education are aware that the Election Commission of India celebrates 25th January, its Foundation Day, as the National Voters Day every year, starting from 25th January, 2011. The Commission's objective is to increase enrollment of voters, by using this occasion so as to make universal adult franchise a complete reality and thereby enhance the quality of Indian democracy. The day will also be utilized to spread awareness among voters regarding effective participation in the electoral process. - Drawing and Quiz Competitions on or during run-up to National Voters Day with the theme of Democracy and Electoral Participation. He has also requested to direct that all staff and officers in the Government Departments and Offices in the State take the NVD Pledge on the National Voters Day (25th January, 2019) some time in the forenoon to promote democratic electoral participation. or during run-up to National Voters' Day with the theme of democracy and electoral participation under the guidance of District Election Officers / Electoral Registration Officers in the district / Assembly Constituency concerned. School Education - Celebration of National Voters Day on 25.01.2019 - Conduct of Drawing competition in the Schools / Colleges -Instructions - Issued - Reg. While enclosing the copies of the references read above, the Regional Joint Director of School Education, Hyderabad, Warangal and all the District Educational Officers in the state are requested to take necessary action in the matter.